Above and top, renderings provide before-and-after views of El Dorado Chevrolet’s lot. At left, an aerial rendering shows blue canopies with solar panels and other canopies that could receive panels later. 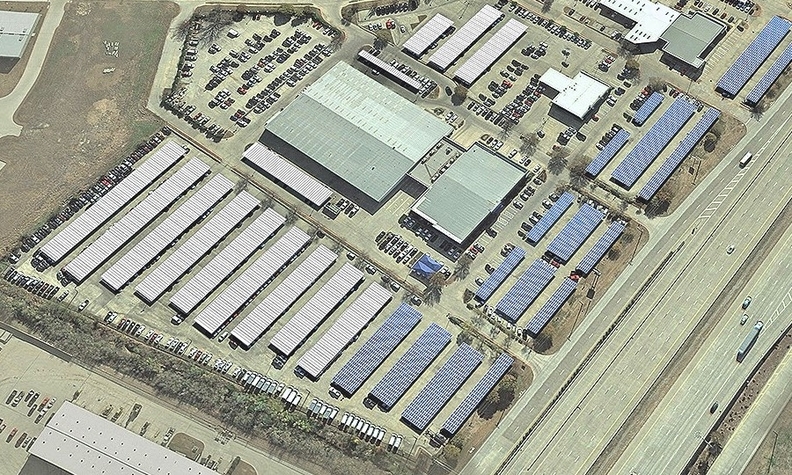 Dallas-area dealer Stan Graff plans to install 37 vehicle canopies at 2 dealerships, topped with solar panels that are expected to provide more than enough power for the stores and lower hail insurance costs. While Texas is known for its oil riches, dealer Stan Graff is setting his sights on solar energy and taking advantage of the state's deregulated electricity market to boost profits for two of his stores. 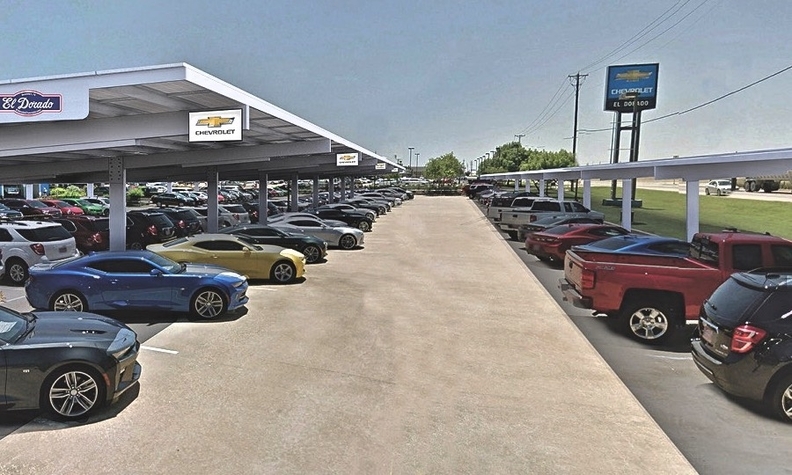 Graff plans to spend up to $5 million to install 37 car canopies, including 17 topped with 3,456 solar panels, at El Dorado Chevrolet and El Dorado Mazda in McKinney, north of Dallas. The project will result in net-zero-energy buildings on the two dealerships' 28-acre campus, meaning that the amount of renewable energy created annually will exceed the energy used by the stores' buildings. In many states, the local utility would be obligated to buy that surplus electricity. But Texas' deregulated market doesn't require that, and deals must be negotiated individually. So Graff worked on an alternative with Sunfinity Renewable Energy, a Dallas solar power company. Under their arrangement, Sunfinity will set up the dealerships' installation as a "community solar project" — sometimes referred to as a solar garden or shared renewable energy plant — in which a business or community shares the energy generated from the solar panels. "That was the big win," said John Billingsley, CEO of Sunfinity. The system is expected to offset more than 45 million kilowatt-hours of electricity over a 30-year life, and to save Graff more than $4 million in electricity expenses. Excess energy not used on-site will be exported to the state's power grid, generating electricity credits for Graff's dealerships through a negotiated contract with a retail electric provider, Billingsley said. Those expected savings and credits are in addition to negotiated insurance premium reductions, as the canopies will cover roughly 1,200 vehicles — protecting them from hail, a persistent threat in that region of Texas. "This is a huge capital expenditure, and a lot of dealerships wouldn't be able to do this," Graff said. "It's going to allow us to lower our insurance costs, utility costs, a better environment." 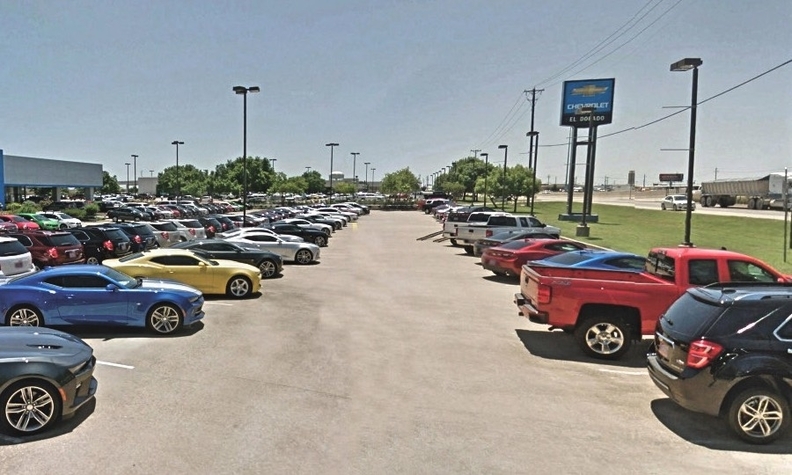 After hailstorms in recent years, Mark Welch, general manager of all four of Graff's North Texas stores, said combined hail insurance costs for the four dealerships more than quadrupled since 2016. "As a dealer, what we have to make a decision on is we're either going to reduce our inventory considerably, which impacts our customer benefit and the manufacturer would pout, or we're going to have to find a way to protect our cars and drive that cost down," he said. Planning for the project began more than a year ago. Construction is expected to begin soon and be completed in the third quarter. It is the latest green initiative for Graff, an outdoorsman who owns a 4,000-acre ranch. Other programs include landscape design using plants suited for Texas with low water requirements, LED lighting, a recycling program to cut solid waste disposal by 35 percent or more and a filtration system to recycle water from floor-cleaning equipment. "When we built this [Chevrolet] dealership back in 2002, we tried to do some innovative things," Graff said. "I love the outdoors and it just made good sense. It was also a way to be more cost effective. We thought we would do some things to lower our water costs, lower our energy consumption and things like that." Such actions, according to officials, have saved the El Dorado dealerships hundreds of thousands of dollars since the stores were built. Sunfinity, Billingsley said, is in talks with dealers from several other states such as California, Georgia and Illinois to create similar solar projects. Brad Snyder, president of Sunfinity's commercial division, said insurance savings for dealers are expected to vary by provider, policy, inventory and even location.